If the notion of eating Kale Chips sounds freakishly weird to you, please just give ’em a try. They are so worth it. Yield: Fills 3-4 14" x 14" Trays for the Excalibur Dehydrator Servings: 8 if you're lucky- They're just as addictive as a bag of potato chips. 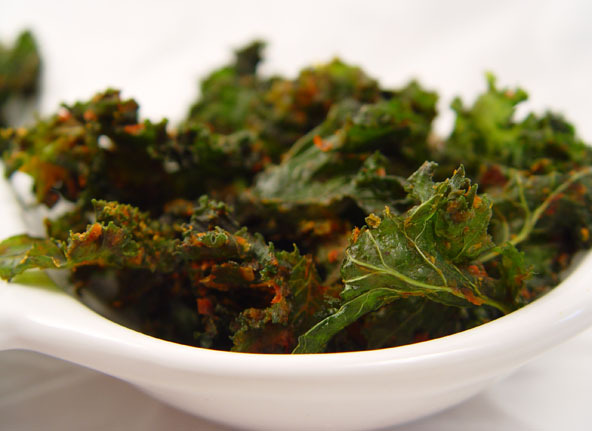 This recipe is one of the best Kale Chips recipe ever! Seriously by far! You will need a dehydrator to make these especially light and crispy without burning them. For a less optimal baked version you can bake them at 300 for approximately 12 to 15 minutes. But watch them very carefully as they burn easily. 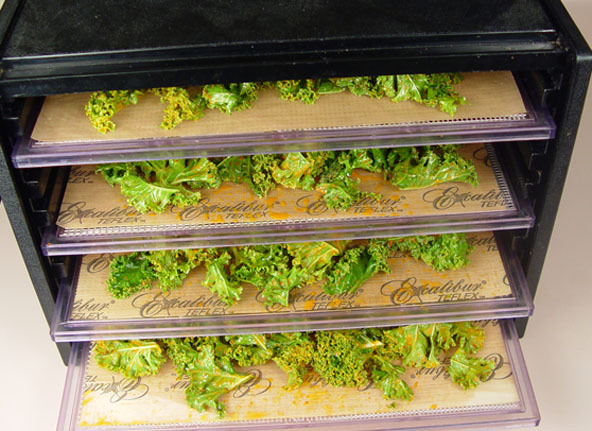 The Excalibur dehydrator is an excellent dehydrator as it is large enough to hold multiple (size 14" x 14") trays of leaves. 2-3 bunches of curly kale- depending on the bunch size (about 20-25 cups or 2 lrg mixing bowls full or 1 extra lrg mixing bowl) with stems removed and cut into approx. 3”x2” pieces. (Can also use lacinato kale (aka dinosaur kale), spinach or collards but the curly kale works best because they turn out to be the crispiest) See more info in the notes. Wash and shake or spin dry the Kale leaves. Remove the stems from the leaves with a knife or kitchen shears. (The stems can be saved and used in smoothies and yes, you can freeze them for smoothies). Cut leaves in about 2 to 3 inch strips. They will shrink in size dramatically. Set leaves aside. Rough chop the bell pepper and or cucumber so that it will blend easily and put in a high powered blender first because they have the most liquid. Add all the rest of the ingredients except the kale and blend together. Don't pour the wet mixture over the bowl of greens. Instead pour the wet mixture into a large mixing bowl and add the greens into the bowl a handful at a time. You want to make sure you have enough liquid to saturate the greens. Any left over greens can be added to smoothies, salad, stir fry etc. Using your hands, rub the wet mixture into the leaves. You will know when you have the right balance when the leaves look well saturated with very little liquid at the bottom of the bowl. Put a small amount of olive oil on the Teflon sheets and spread it around with a pastry brush/ Place the kale on the Teflon sheets & dehydrator trays. Spread them out a bit but don’t bother to spread them out individually (kale leaves will shrink substantially). For a truly raw version (keeping the enzymes alive): Dry on 118 degrees for 8-10 hours or until crispy. After about 4 hours into it you can flip the leaves over and remove the Teflon sheet to help it dry faster. If you don’t do this, it will prolong the drying time. Dehydrating overnight works well as you don’t have to worry about over drying it. You might have to worry about someone sneaking in during the night and eating all the kale chips though. just warning ya. For a slightly faster version: Dry using 125 degrees or even the highest setting on the dehydrator. This shortens the drying time to 6-8 hours instead. After about 3 hours into it you should flip the leaves over and remove the Teflon sheet. This helps it dry much faster. I know "Bunches of kale" is quite a varying amount. It depends on what size the leaves are and what size the farmer is bunching them to. But having more kale on hand is better than not having enough. Kale freezes well and can easily be added to a boat load of recipes which of course include smoothies. What you're going to want to do is wash and trim the kale, set it aside and then add the kale leaves a little at a time to the prepared liquid mixture in a large bowl. This way you will use just the right amount of kale for the liquid to saturate and then be able to keep the left over kale (if any) for another dish. 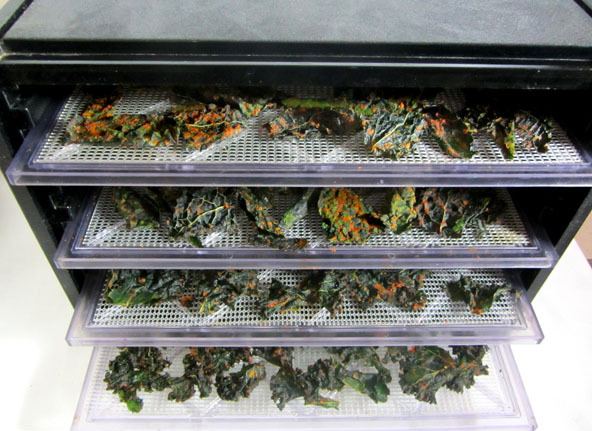 You can half the recipe if you have a smaller dehydrator or just want to make less. If you do this be sure to use a smaller blender like a magic bullet because this smaller amount of ingredients will not extend over the blade in the larger Vita Mix or Blentec blenders. Here they are on the teflon sheets to start drying. Here the teflon sheets were turned over and removed to continue the drying process which speeds up the drying time. They may not look like much but they taste fantastic. If anyone thinks its hard to eat a lot of greens, they need to try these. Bet you can’t eat just one!